Philadelphia History Museum at the Atwater Kent, 15 S. Seventh Street, Philadelphia. Drag across the screen to turn the object. Zoom to view details. Read more below. A staggering number of figures are crammed tightly onto only half of this teacup. Upon closer inspection, it appears that all thirteen men bear a striking resemblance to one another. Are they related to one another, or did they fall victim to the hand of a hurried artist? What exactly is going on in this tableau? The scene rendered in porcelain above is an interpretation of the John Trumbull (1756-1843) painting, The Declaration of Independence, which portrays the signing of the Declaration by members of the Continental Congress in the Pennsylvania State House. In the painting, Trumbull took a few architectural liberties when he rendered the Assembly Room. 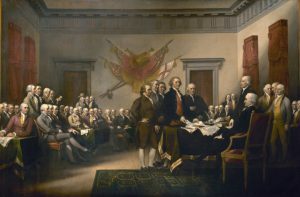 Not all of the men Trumbull depicted were present at the same time, five of them never signed the document, and fourteen of the original signers were omitted altogether. After its completion in 1818, the painting was placed in the Rotunda of the Capitol Building in Washington, D.C. It became one of the most, if not the most, iconic depictions of the signing and was reproduced innumerable times throughout the nineteenth and twentieth centuries. The teacup has an inverted-bell shape, a footed base, and is decorated with a range of colors. Some of the paint has chipped off, but a band of blue stars and alternating purple and pink flowers is still visible on inside lip of the cup. A lack of space on the outside of the cup reduces Trumbull’s forty-seven men to thirteen. They are assembled around two tables upon which rest a book and sheet of paper. Perhaps owing to a need for an economy of effort on the part of the artist, the men wear nearly identical black jackets and white shirts, but their breeches are painted in a variety of colors; blue, purple, yellow, and pink. Barely visible in the background are a light green ground and two brown frames, suggesting doors or windows. A version of the American seal graces the other side of the cup, complete with eagle; red, white, and blue shield; olive branch; and clutch of arrows. The eagle holds a banner bearing the words “The Declaration of Independence” in its beak. The cartouche under the eagle displays the date 1776. Approximately seventy-five pieces similar in decoration to this teacup are in the collections of American museums. The miscellany of dishes includes cups, saucers, small pitchers, and at least one tureen, and it is believed that the pieces were created independently of one another. That is, there was never a set of Declaration of Independence porcelain. The highest concentration of Chinese porcelain bearing this design is held by the Winterthur Museum near Wilmington, Delaware, and was purchased by Henry Francis du Pont (1880-1969) in 1948 from Dr. James McClure Henry (1880-1958), a Presbyterian missionary. Henry had procured them from a single dealer in Canton (Guangzhou), China between 1939 and 1947. This teacup was a gift from William H. Noble Jr. (1901-92) to the Atwater Kent Museum–later renamed the Philadelphia History Museum at the Atwater Kent–in 1950. Noble, a native of Palestine, Texas, later moved to Philadelphia, where he was employed as a lecturer by the University of Pennsylvania Museum as early as 1938. At the onset of World War II, Noble enlisted in the United States Navy. He served in the Office of Naval Attaché in Istanbul, Turkey, from September 9, 1942, to January 5, 1945, and as the Assistant Naval Attaché in Canton, China, from December 1945 to July 1946, when he was discharged from service. His resumed his interest in Philadelphia’s museums after the war. In 1950 the University of Pennsylvania Press published his ninety-six page pamphlet, Philadelphia’s Treasure Houses: A Guide to Museums Open to the Public. It is possible that Noble bought the teacup when du Pont was selling pieces of Declaration of Independence porcelain, or he might have purchased it earlier when he was stationed in Canton. One can easily imagine a Naval officer with a passion for history, museums, and artifacts being drawn to the patriotic imagery on this teacup. Although often identified as objects related to the surge of patriotism fed by the 1876 Centennial in Philadelphia, scholars now believe that the dishes were created between the 1920s and 1940s, shortly before Henry procured his cache. In their research, Ronald W. Fuchs II and Jennifer L. Mass found no porcelain with the distinctive pattern in the historic record prior to 1955, when an exhibit catalog referenced two of the Winterthur pieces. The most conclusive body of evidence comes from an energy-dispersive x-ray fluorescence analysis (XRF) Mass performed on pieces of the Declaration of Independence porcelain as well as on pieces from President Ulysses S. Grant’s 1869 dinner service. 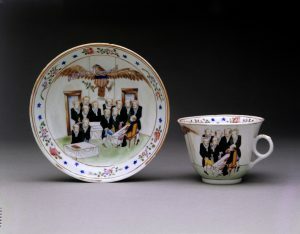 Chromium and zinc levels in the green, cobalt, and black enamel in the depiction of the Declaration of Independence do not correspond to the levels found in nineteenth-century Chinese-made porcelain, but rather to levels of pieces that are irrefutably dated to the twentieth and twenty-first centuries. Although the teacup was not among the constellation of souvenirs created for the 1876 Centennial celebration, it is indicative of Philadelphia’s leading role in the global economy from its earliest days. Colonial Americans were well acquainted with Chinese porcelain thanks to European merchants who imported pieces from the sixteenth century onward. Prominent Philadelphian Robert Morris (1734-1806) backed the first American vessel to initiate direct trade with China, The Empress China, which set sail from New York to China in February 1784. When the ship returned, part of its cargo was consigned to Mordecai Lewis (1748-99) of Philadelphia and sold to the city’s residents. Some of those objects, like this teacup from a later era, ended up in museum collections as reminders of Philadelphia’s connections to the wider world. Text by Mandi Magnuson-Hung, who earned a master’s degree in history at Rutgers University-Camden.